On Monday February 4th 2019, the West Grey Police Service received a call regarding an abandoned vehicle on SDR 25 south of Concession 16. The vehicle in question was a blue 2001 Dodge Ram pickup truck and checks showed it had been stolen earlier that day from Meaford. A single set of tracks left the vehicle. This investigation is ongoing and anyone with information is asked to contact the West Grey Police Service at 519-371-6911, the OPP at 1-888-310-1122 or Crime Stoppers at 1-800-222-8477 www.cstip.ca. Sometime overnight on February 7th 2019, a grey 2010 Dodge Caravan, bearing an Ontario Licence Plate #CEMJ-843 was stolen from a residence on Concession 2 NDR in Bentinck. The name “Hollie” in pink was on the driver side window. More than one person is believed to have been involved as police observed ATV tracks to be present in the vicinity of the theft. Anyone with information can contact the West Grey Police Service at 519-371-6911 or Crime Stoppers at 1-800-222-8477 www.cstip.ca. On February 8th 2019, between 10:30am and 1:30pm culprit(s) broke into a residence on Concession 18, Normanby while the family was away at a funeral. Entrance was gained to the residence by smashing a rear door window and once inside a quantity of jewelry, cash, coin sets, a HP laptop and several gift cards were stolen. Some of the jewelry stolen was; an opal set (ear rings, necklace and ring), a gold 3 pearl ring, 2 necklaces with diamond pendants and a Pandora bracelet with charms. 3 coin sets, 1 from 1984 in a leather case, along with a $50 Beer store gift card and a $50 LCBO gift card. It is believed that the culprit(s) knew that the family would be out of the home as the family funeral was posted in the local paper. This investigation is ongoing. Anyone with information can contact the West Grey Police Service at 519-371-6911 or Crime Stoppers at 1-800-222-8477 www.cstip.ca. 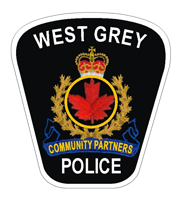 For the week of February 3rd to 9th , West Grey Police responded to 6 motor vehicle collisions. With our inconsistent and ever changing weather with the freezes, thaws and squalls all drivers need to be aware of the continuous change in our area’s weather and road conditions. For the most up to date road conditions, please contact the Ministry of Transportation by dialing 511. Please do not call 911 for road conditions.